Crumbly, buttery shortbread. Three key ingredients. Baking doesn’t get much more simple – or crowd-pleasing. Whole wheat flour, the subtle caramel of brown sugar, and hints of vanilla and almond make it special. It also has the distinction of surviving a kitchen disaster, and thus I am certain that it is resilient enough so that all of you can make it in your own kitchens! Shortbread is one of the most mesmerizingly simple cookies. With its origins in the British Isles, it is no surprise that technique and texture are critical to something traditionally made from only three ingredients: flour, butter, and sugar. That’s it. No wonder it has withstood the test of time and globalization. Like making a pie crust or pastry dough, kneading in cold butter is the trick to achieving that perfectly flaky, yet soft cookie. I don’t know about all of you, but I lack the patience and precision to make it authentically perfect. I certainly didn’t want to mess with a good thing, but I made a few minor tweaks so that you can easily reproduce it in your own kitchen. I used whole wheat pastry flour to add at least a hint of nutrition and less refined carbs, and I added vanilla and almond extracts. I believe that it is a baking sin to leave out vanilla in most sweet baked goods. I also did not go through the precarious steps of folding in the cold butter to the flour, because I didn’t think you would want to deal with that step, either. Just don’t do what I did the first time I attempted it. If you ever want to feel less clumsy in the kitchen, read this story. I know I risk completely destroying any culinary credibility I had with you by telling it so publicly, but I also am willing to humiliate myself because kitchen disasters happen to all but the most OCD of us! It is a lesson that disasters happen, but hopefully the recipe is half as resilient as the people who first created it long ago. So anyway, I made the dough with the below recipe, rolled it out, pressed it into the pan evenly, strategically pricked it with a fork, and set it in the oven. Halfway through baking, it appeared to be on track for success. I removed the pan about 25 minutes into baking in order to sprinkle course (caster for you in the UK) sugar atop it to add a crunch and give it a hint of a crust. I sifted the sugar, but some of the pan was unevenly covered with it. So I moved the hot pan to the sink to shake loose any excess sugar, slightly inverting it. Ok at this point, you’re reading this wondering, what was she thinking? Hubris. Excessive pride in my baking ability – hello, I’ve been baking since I was eight. 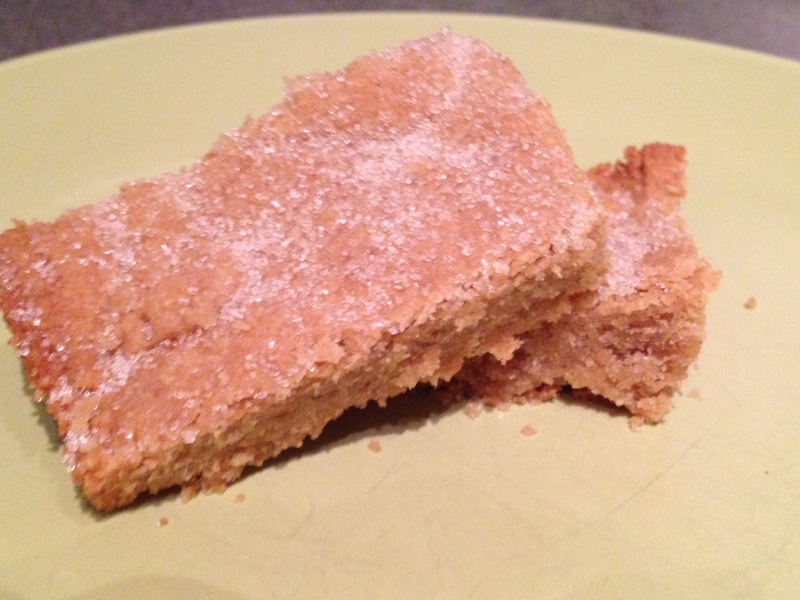 But one aspect of shortbread I wasn’t used to was its high butter content. So as I continued to invert the pan with only my hand to protect it, the dough started to slide out of the pan and into the sink, burning my hand in the process. I did not accept defeat. I salvaged what didn’t slide into the sink by spreading it – much more thinly – across the pan by hand (did I mention my hand already was burnt?). I sprinkled sugar back on top, leaving it alone this time before placing it back in the oven. Twenty minutes later, it was done. And surprisingly, it worked. It was delicious. It got eaten (shh, don’t tell my colleagues!) with rave reviews. So the real moral of this story is just because it tastes perfect doesn’t mean it is. So suspect the chef! I kid. What I mean to say is that accidents happen. You might not execute a recipe the way your cooking show host did on television (or You Tube. Whatever!) or the way it looks in those Pinterest photos. Recover and move on. It will turn out ok. If not, try again! And in the end, few probably will be able to tell the difference! Preheat oven to 325 degrees Fahrenheit. In a large mixing bowl, slowly cream butter and sugar by hand or with an electric mixer on its lowest speed setting. Add in vanilla, almond extract. Gradually mix in flour, 1/2 cup at a time, until just incorporated – don’t overmix! Lightly flour a large piece of parchment paper on a flat work surface. Knead the dough by hand, for about 5 minutes. Transfer to an ungreased 8″x8″ (for thick fingers) or 9″x12″ (for thinner cookies) baking pan. Pat dough evenly; prick by fork throughout the dish to aerate and for decoration. Bake for approximately 45 minutes (one hour for thicker fingers), or until firm and edges are browned. Remove and cool in pan. Cut into narrow rectangular fingers.